With high visibility yellow safety edges. Raised bubbled surface to improve blood circulation. Individual mats, or interlocking section pieces for longer runs. An employee working on their feet all day, mostly in one place, can start to feel the effect of loss of circulation and find it difficult to concentrate. 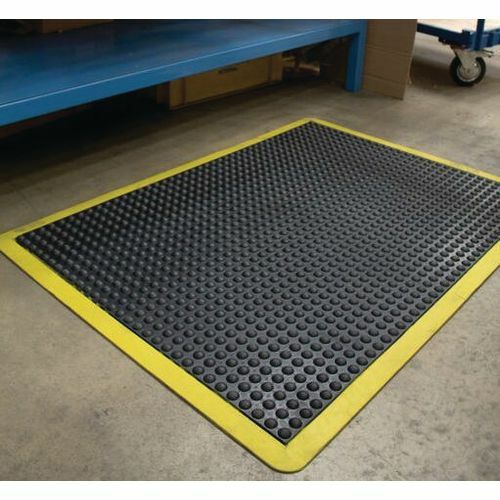 Our bubble mat with safety yellow edge gives employees a more comfortable surface to work from, helping to encourage better concentration while working and standing. The yellow safety edges help to prevent employees from tripping on the matting; they are 100% rubber and 14mm in thickness. A raised bubbled surface helps to improve the blood circulation for the user who is standing on the mat. There are two sizes available - W x L mm; 600 x 900 or 900 x 1200. There are also three types to choose from; a bubble mat or interlocking end or middle mat to create longer running matting. Our bubble mat with safety yellow edge provides the user with a more comfortable surface to work from and it encourages improved blood circulation. They also come with FREE UK Delivery.